The LTER research area encompasses both shallow and coastal waters as well as deep, offshore canyons. Where the canyons meet the shelf break is of interest to the LTER scientists. This area tends to harbor warm, nutrient rich water that makes it’s way up from the deep. The warmer water (only several degrees warmer than freezing) hits the surface water and is cooled by the atmosphere. With longer daylight hours during the Antarctic summer season, these areas create “biological hotspots, which are characterized by rich phytoplankton blooms. These blooms of phytoplankton fuel productivity throughout the Antarctic food web. To help understand what’s happening through these areas, you need to study the water that comes from these different depths. How do you do that? With a CTD! The Conductivity, Temperature and Depth instrument is a cylindrical metal frame surrounding a group of sensors. The sensors measure three physical properties of seawater – salinity, temperature and depth. Aboard the LMG, the CTD resides in a large room called the Baltic room. Surrounding the outside frame of the CTD are 24 gray Niskin bottles that form a rosette. The Niskin bottles are triggered to open and shut at various depths, capturing water samples within the bottle. 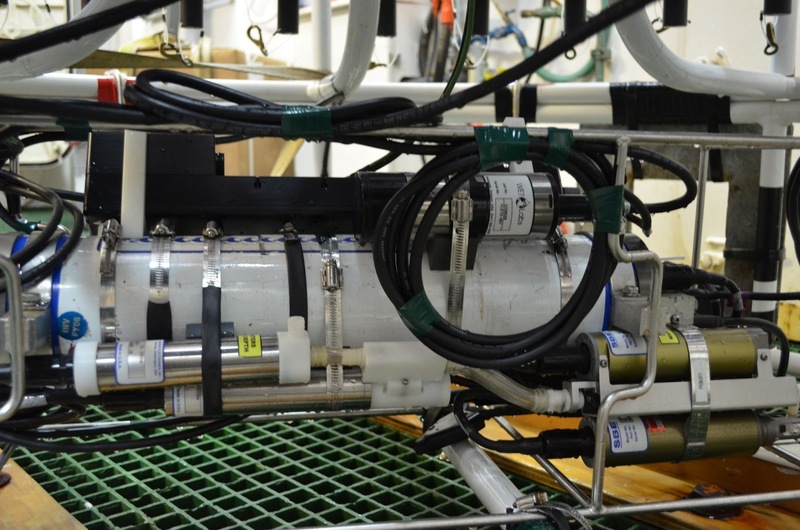 Once the instrument is back at the surface, the researchers open the Nisken bottles and drain out specific amounts of the water to analyze the waters properties and run different experiments. In order to deploy our CTD, the L.M. Gould has a massive two-story door that opens on the side of the ship. Using a huge winch, the CTD is moved out of the Baltic room until it is hovering over the water. The technicians lower the CTD using the winch until the instrument is at the appropriate depth in the water column. Go back to the water depth graph that I sent you. Can you tell me what depth this cast went to? Post your answer! The sensors on the CTD are connected to a computer on board the ship. 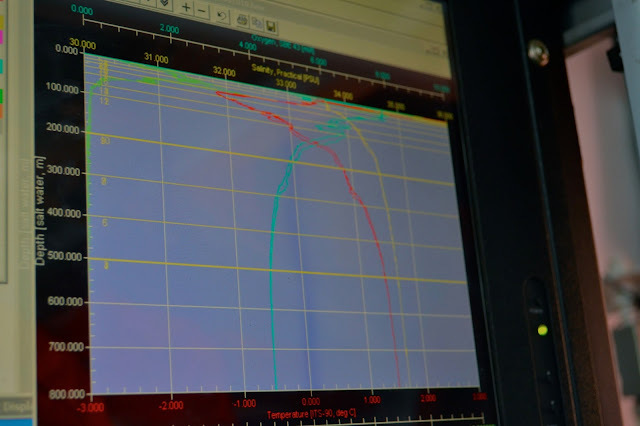 As the CTD is sinking, the researchers can watch the computer monitor and determine what depths they need water samples. The technicians then set the sensors on the CTD to stop at these specific depths while the CTD is being raised back up to the ship, triggering the bottles to capture the samples. 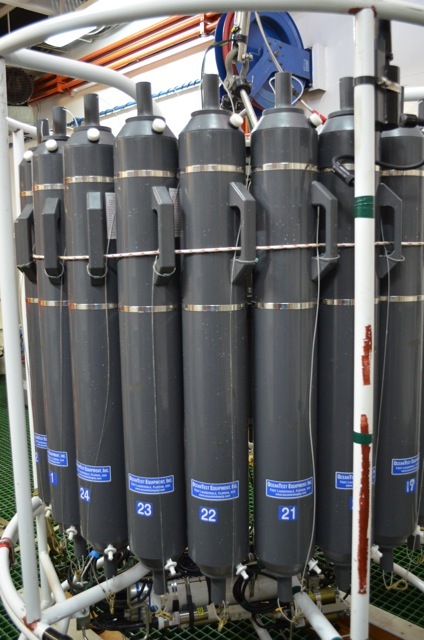 My team of researchers study phytoplankton and we spend a lot of time using the CTD. Many of our water samples come from shallow depths, allowing us to figure out what plankton grow near the surface. Other groups, including those that work with bacteria or ocean chemistry and nutrients also rely on the CTD to bring up water samples. 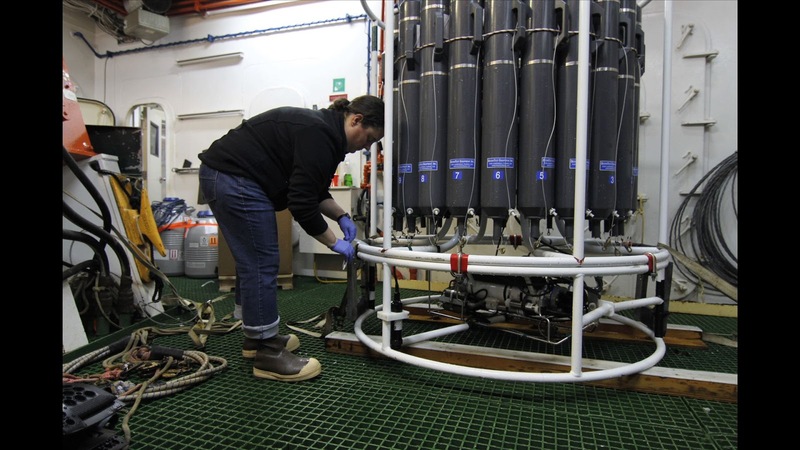 Often times there are quite a few people gathered in the Baltic room when the CTD comes back to the ship because everyone is siphoning off their samples all at once and then heading back to their respective laboratories to run experiments. Once my team collects the water, it’s off to start examining what phytoplankton lives in that water!